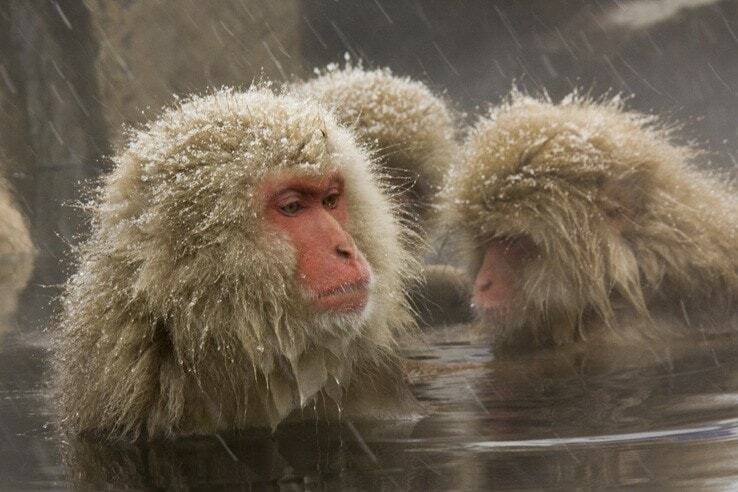 The Japanese snow monkeys in Japan are a fabulous experience, especially if you can time your visit for a snowy winters day when you will see their natural area at its best. It's reasonably easy to do this as an independent day trip from Tokyo. Let us show you how. 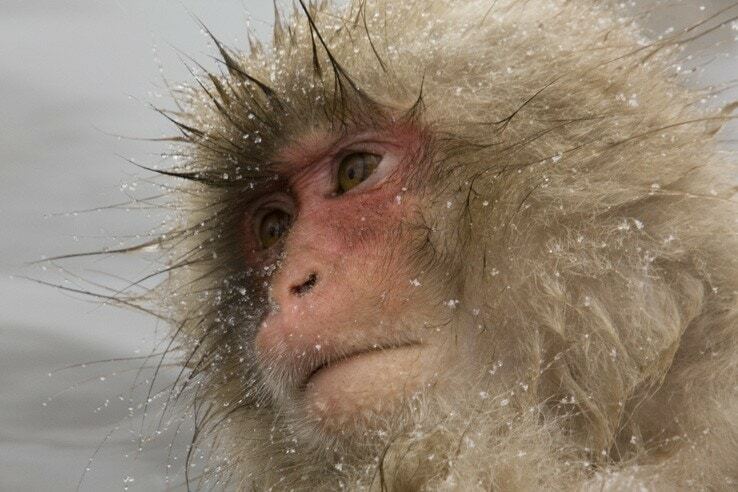 I tried everything to shuffle our schedule to allow an overnight in Nagano to see the Snow Monkeys. No matter how much I reshuffled the plan I couldn’t fit that extra night into the timetable. To make it work I planned a day trip from Tokyo, a long day but perfectly possible and it allowed us plenty of time with the monkeys without feeling rushed. This was probably one of my best days in Japan and I would recommend it to anyone. We enjoy hiking and nature so being able to incorporate that into the cultural aspect and experiencing powder snow for the first time was fantastic. The day trip is ideal if you’re travelling with a JR Pass. The cost of using single tickets is quite high for a day trip but I would have done it to make it work, it was an experience I really wanted to have. The JR Pass doesn’t fully cover the transport but the additional portion is relatively low. We find the Shinkansen a relaxing way to travel so although you’re out of bed early you can chill out or even catch up on your sleep if you aren’t bothered about missing the scenery outside your window. You can buy food on the train or my preferred option is to stop at the bakery (breakfast) or grab a Bento box for eating on the train in the evening. While you shouldn’t really eat on commuter buses and trains it’s perfectly acceptable to take food and hot drinks onto long-distance trains in Japan. If you can’t face the coffee in a can from the vending machine there is usually a Starbucks around the station somewhere. These photos were taken at Jigokudani in the north of Nagano prefecture. 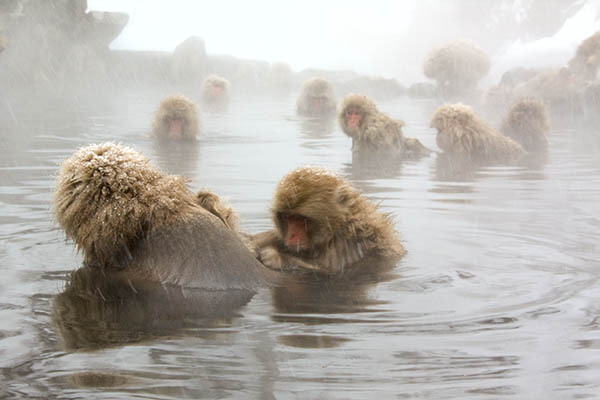 Located on the edge of the national park this large group of monkeys are regularly found along the trail and particularly in winter enjoying a soak in the onsen (hot pool). In the mid-1960s two groups of monkeys were regularly in the area and were seen squeezing into a small pool in a rock crevice where hot water bubbled through. 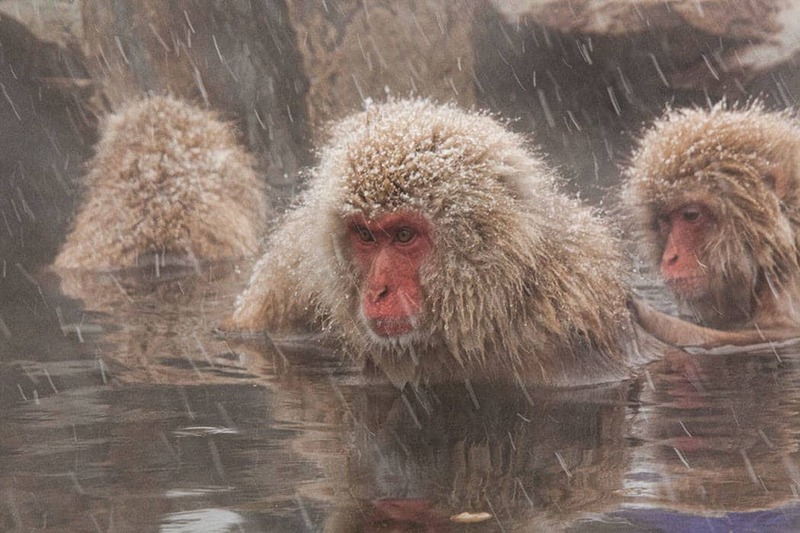 Locals made the monkeys their own onsen and they’ve been visiting ever since. 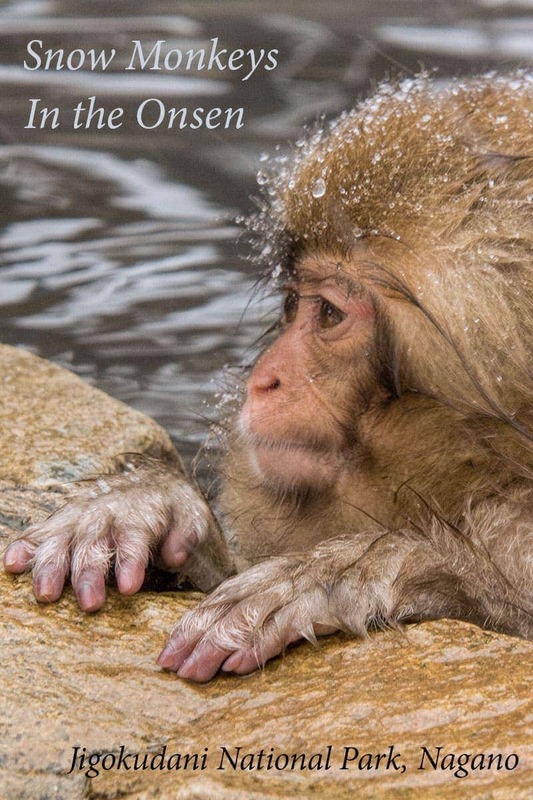 The monkeys are indifferent to the people watching them bathe, they continue to go about their business; soaking, eating and even fighting without interacting with those snapping a few photos of them mid-soak. Every time I look at these photos I want to go back. This will depend on where you are staying. Unless you’re within walking distance of JR station you’ll probably need to take the subway first. We were staying at the Hotel New Otani in Akasaka where we have based ourselves a few times. It’s an 8-minute ride on the Marunouchi line to Tokyo station. Tokyo station is well sign-posted in English but it’s a very large station so it’s worth adding a few extra minutes to navigate your way around it if you haven’t got your bearings yet. We saved a bit of time on the day by having our Shinkansen (bullet train) tickets pre-booked which is a free service to JR Pass holders. Having a map of JR station if you’re not familiar with it is helpful. You will also probably pick up a Tokyo subway map when you arrive but here is the electronic version. From Tokyo station take the Shinkansen ASAMA or Kagayaki service to Nagano city. If you are day tripping like we did it is worth making an early start, we took the 6.24am Asama 501 and it gets in at 8.04am. It’ll take around 90 minutes and Y8000 for the 222km journey. If you have the JR Pass this part of the trip is covered by that. A great tool for planning your trip is the Hypedia website, it’s in English and when you plug in your starting and ending stations and any other constraints like transport type, times etc it will give you all the route options and costs. If you are using the JR Pass and are on JR trains such as the bullet train (shinkansen) the price is covered by your existing ticket. Local transport – the Nagaden train and a 5-minute bus trip. The express bus (tourist coach). There are advantages and disadvantages to each and your choice will depend on your travel preferences and the experience you’re after. The express bus is almost exclusively used by foreign tourists and is a slightly faster option to get out there. On the downside, it offers less flexibility on your schedule and it can feel a little like a large tour when it’s busy with a big group piles off the bus at the same time headed to the exact same place. With either of these two options, if you are departing from and returning to the Nagano station area on the same day this pass can offer good value, convenience and simplicity. 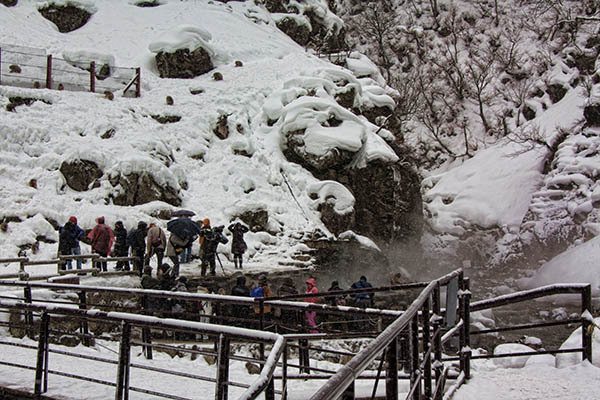 It costs Y2900 for the full day and includes all your transport for either option plus entry to the snow monkey park which is a good saving, about 12% discount for the basic trip and park entry. You will need to purchase your pass with cash, credit cards weren’t accepted. The company providing both bus and train transport to the area is Nagaden and their station and ticket office is located adjacent to the JR Nagano station. Head out of the Zenkoji exit and turn right, walk along the front of the station, don’t cross the road and the entrance will be down some stairs directly in front of you. It’s very close and only takes a couple of minutes from arriving at the shinkensen platform. There are lockers in Nagano station if you need them. Take the Nagano Dentetsu limited express train to Yudanaka station. Yamanouchi town is 45 minutes away and if you prefer to buy individual tickets they will cost Y1260 for the 33km journey and as it is a different company they aren’t covered by the JR pass. Look for the Nagaden line at the station and if possible take the limited express which means you stop at only 3 not 23 stops. The train doesn’t go that often so this map should help find quickly your way from the Shinkansen to the Nagaden line to make the connection. From Yudanaka station take the local bus. Finding the right bus at the station was easy, they line up with the times to the train arrival but knowing when to get off can be more difficult if you don’t speak Japanese. It will take around 15 minutes and costs Y250 to Kanbayashi Onsen and then a walk through the village to the trailhead. Even in light snow, the walk wasn’t a problem, probably partly because of the novelty value. If you don’t speak Japanese watch the time on the bus and the scenery closely out the left-hand window, we got distracted and went past our stop the first time and had to backtrack. 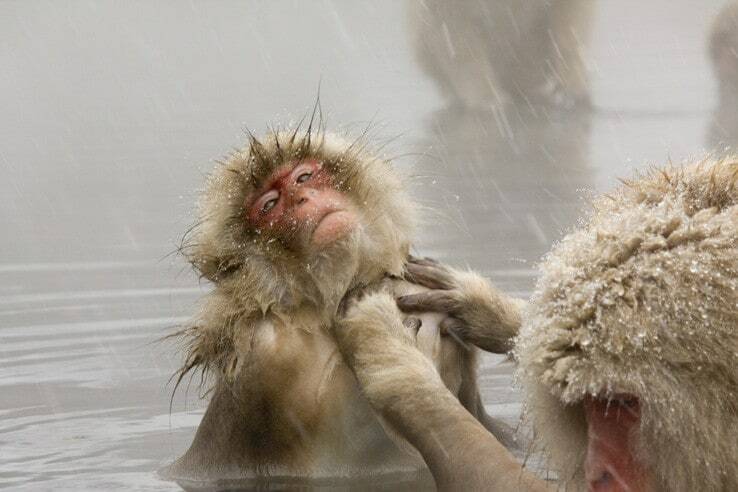 Alternatively, show the picture of the snow monkey on your pass to the driver when you get on at the station and sit near the front, he will stop and indicate for you to get off at the right stop. The bus is a comfortable coach similar to the airport service where luggage can be stored underneath and the seats are more spacious and comfortable for a longer trip than a local bus. If you buy individual tickets rather than the pass it will cost Y1400 each way. The bus you want has Shiga Kogen for its final destination but you will get off at Kanbayashi Onsen and walk up to the trailhead from there. The bus takes about 45 minutes. 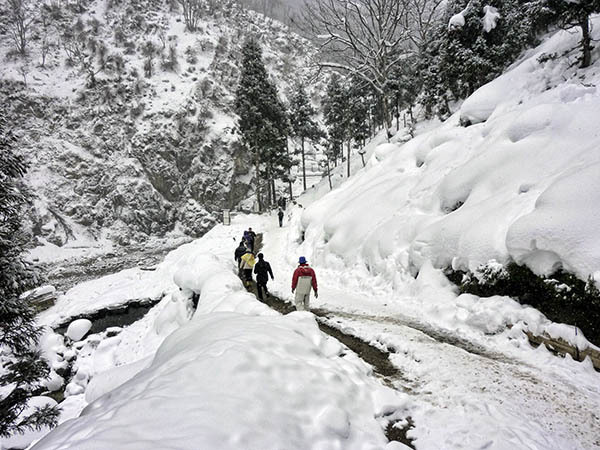 If you’re looking for a guided tour this is a great option with Snow Monkey Resorts. They will pick you up from Nagano station and deliver you back for your train back to Tokyo or on to your next destination. It includes transport within Nagano and a knowledgable English speaking guide. 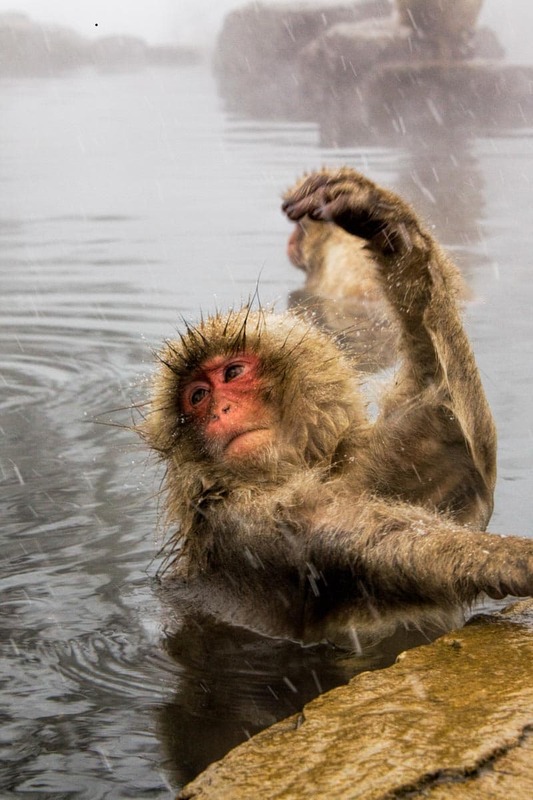 You’ll visit the snow monkeys, eat lunch at a local restaurant, visit the dramatic Zenkoji Temple and enjoy a sake tasting while learning about this uniquely Japanese drink. 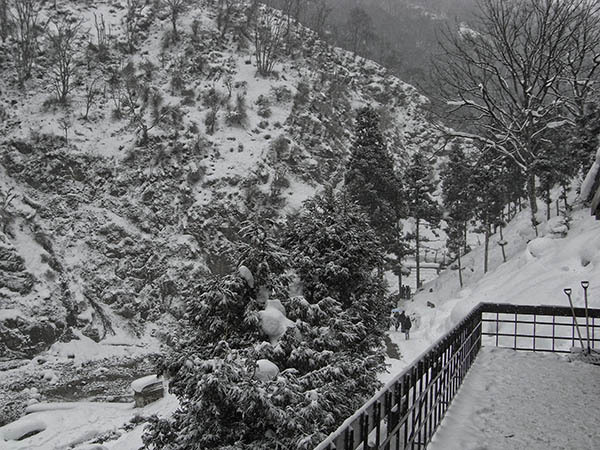 Once you are at Kanbayashi Onsen you walk up the snow-covered road for about 1.5 kilometres. 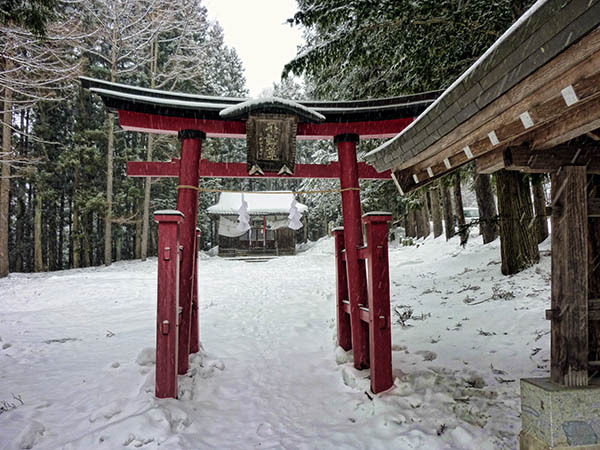 You’ll pass a small shrine to your left and continue until a trail breaks off through the trees, there’s a huge signpost there so you won’t miss it. For the next 1.6 kilometres, the path winds through red pine and Japanese Larch forest to Jigokudani (Hell Valley). All up it is only about a 3km walk. Entry is Y500 and there are lockers so you can put your bag and any food you have with you there to avoid upsetting the monkeys. 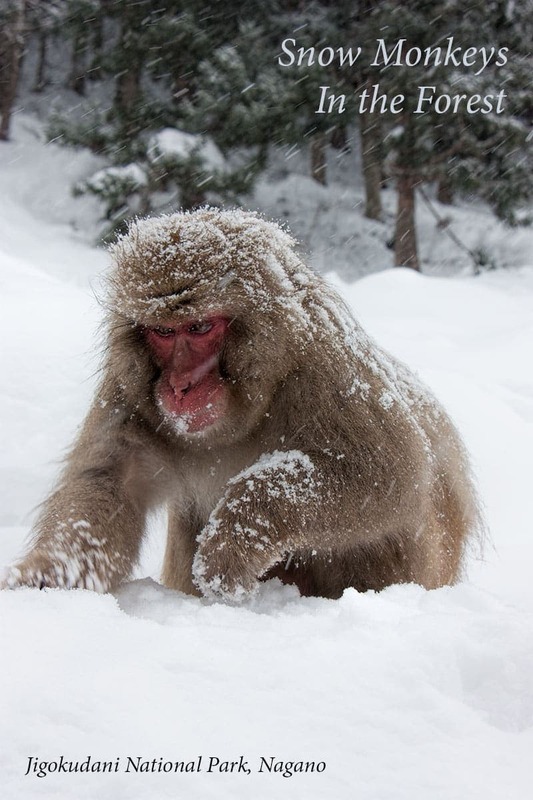 The snow monkeys of Jigakudani are wild, when food is scarce the staff hide supplemental feed in the snow for the monkeys to forage in a natural way. To ensure they remain safe and allow them to retain their natural behaviour you are asked to follow a few simple rules. Don’t make eye contact, for many animals a direct stare is seen as hostile behaviour. Don’t feed the monkeys or take food down to the area where the monkeys are, leave it at the lockers. You’ll pass monkeys on the trail in, they won’t bother you for food. Don’t talk loudly, run or act in a way likely to scare or threaten the monkeys. 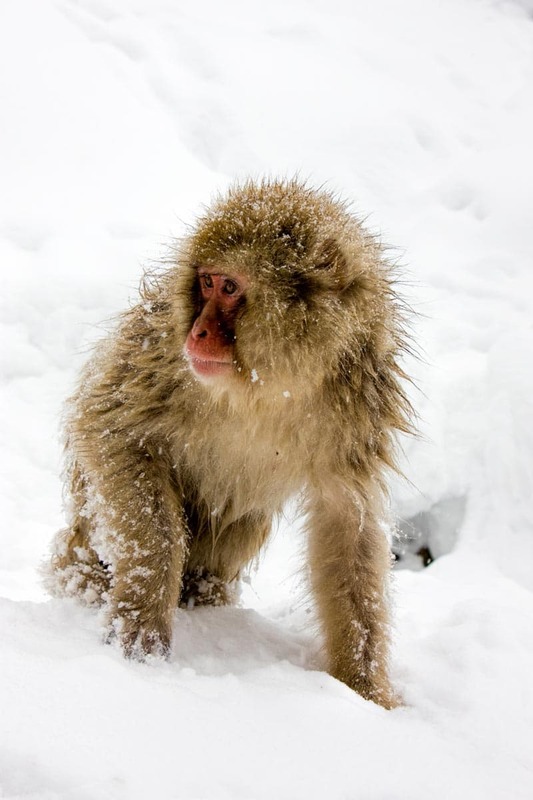 We love to include wildlife experiences when we travel and seeing the snow monkeys in Japan was completely different to encountering monkeys in many other parts of Asia. What’s the most memorable animal encounter you’ve had in your travels? Loving all this information! We are wanting to tie in the Cherry Blossoms in Tokyo next year – late March – as well as seeing snow monkeys in the snow – Im guessing this isnt really possible from Tokyo as much of the snow will have gone by the time late March rolls around, but happy to travel north to experience the snow monkeys in the actual snow – any suggestions on where would be easy to get too – Im thinking an overnight train up north somewhere, a day with the snow monkeys then back to Tokyo the next day??! Thanks! 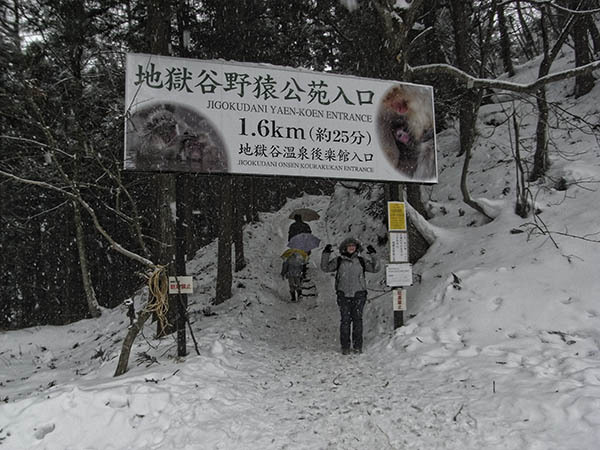 The only place we’ve found to see the Japanese Macaque in the wild like this has been in Nagano, either staying up there or doing the day trip from Tokyo. For this destination the cherry blossom and snow don’t align, you really want February for the snow but late March/early April for the blossom in most of Japan. hi, we are going in April to see the snow monkeys with two children. how long did it take to walk from the bus up to the monkeys? we are planning to catch the express train just before 9am to get there by 10am, and then were planning on leaving by 12:30. Just not sure if we are cutting our time short. Hi Rob, it was 20-30 minutes from memory but we were looking for monkeys the whole way and stopped for photos a few times. It was also the day after heavy snow when we were there, the path had been cleared but we were watching our step not being used to the conditions. 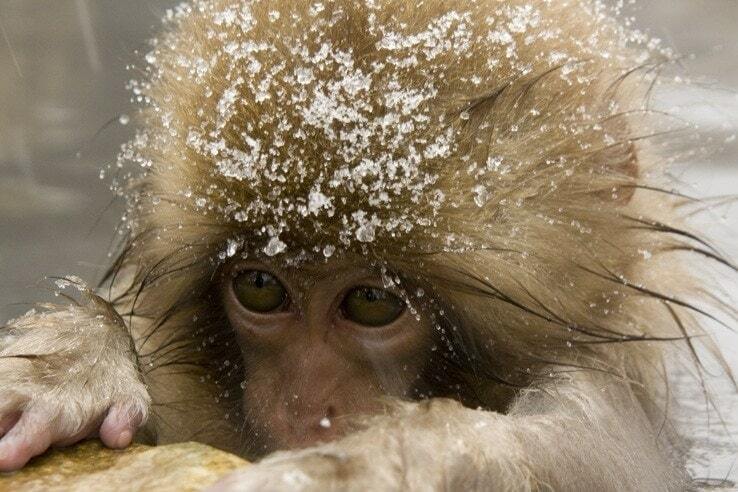 We would love to see the snow monkeys. Would it be worth going in June we are in Tokyo from 12th-17th June? Do you thinks we will be able to see many monkeys? 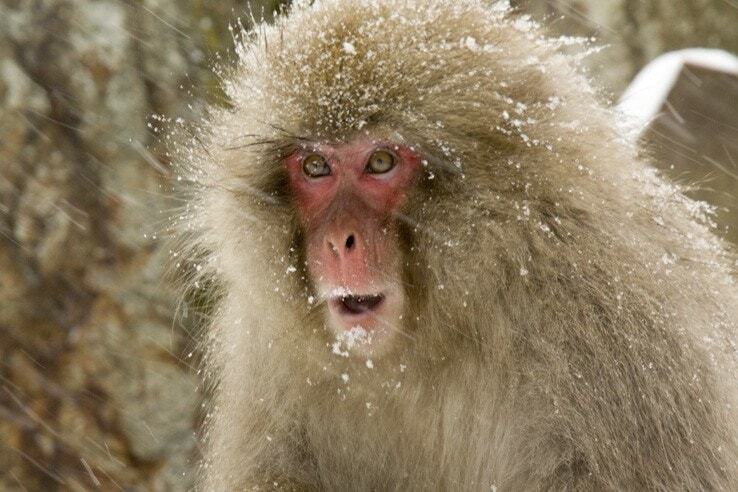 As with any wild animals, there are no guarantees but the snow monkeys live in the forest all year round. The landscape and experience in summer would be very different from seeing them in the snow but many people do make the trip in other seasons. So excited, going on Wednesday! Any other tips recommended for the area or Nagano? Love your blog, so informative! Thanks Miia! Have a fabulous time, I hope you get some fabulous weather for it and maybe a few babies too, we were really surprised even in the midst of winter to still see a few very young ones with their mum. We spent too much time with the monkeys to do much else but a local lunch in the village is nice and if you have an interest in temples Zenkoji is about a 30-minute walk or 10-minute bus from Nagano station, it has a 1400 year history so might be an interesting short addition. Matsumoto Castle in Nagano prefecture is one of the best original castles still in Japan but that’s over an hour further on the train from Nagano station so more than we’d be able to fit into the one day unless we were staying in Nagano. Have fun!